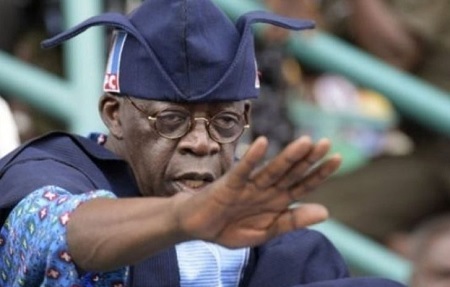 ASIWAJU Bola Ahmed Tinubu, the national leader of the ruling All Progressives Congress has explained the rationale behind a viral video where he was seen throwing an APC flag at the National Chairman of the party, Adams Oshiomhole. A rumour followed the video clip showing Asiwaju Tinubu at the APC Presidential Campaign rally in Abeokuta, Ogun State, throwing the party’s flag to National Chairman Adams Oshiomhole. The opposition Peoples Democratic Party (PDP) had latched on to the clip and interpreted it to mean that all Progressives Congress (APC) Presidential Campaign Council Co-Chair, Asiwaju Bola Tinubu plans to quit the ruling party. Dismissing the rumour, the APC chieftain’s Media Adviser Tunde Rahman in a statement issued to the media explained that Tinubu remained unshaken in the ruling party. The clarification put to rest speculations that the former Lagos State governor was through with the APC because of the disruption of the presidential campaign rally in Abeokuta, Ogun State on Monday. Rahman explained that Asiwaju was passing the flag on to Oshiomhole for presentation to the party’s governorship candidate, Prince Dapo Abiodun. In the statement, Rahman said the claim that Tinubu threw away the party was false. Agreeing that an incident did occur at the Ogun State APC rally, Rahman said it was not what the PDP concocted. He said: “The true incident that should be reported and condemned is that people who furtively oppose the party and the President tried to infiltrate and disrupt this rally. “The attack by these operatives was disrespectful of the office of the President and could have potentially harmed the person of the president. “Such antics have no place in our political discourse. The author of these misdeeds should desist before real harm is done. Now to the crux of the opposition’s latest antics, if the issue of the flag has become the hotspot of the PDP campaign, then they are in serious trouble. “During that portion of the Ogun rally, the national chairman and others were looking for a party flag. Asiwaju Tinubu spotted one within his reach. He picked it up and attempted to toss it to Oshiomhole so that the chairman could present it to the party’s gubernatorial candidate Prince Abiodun. The statement advised those spinning the matter to make better use of their imaginations.